Have you ever thought about becoming a health or nutritional coach? With the natural health and beauty industry booming, this is the best time to become a health or nutrition coach! A Health Coach is a mentor who works with clients, this can include (both personal and business clients) to achieve their wellness goals. A health and nutrition coach addresses all the aspects of health in addition to eating - they will address relationships, exercise, career, and spirituality. So essentially, Health Coaches help people become healthier and happier in all areas of their lives. If you're interested in being a health or nutrition coach in the holistic health and nutrition field, I highly recommend The Institute for Integrative Nutrition. IIN is the world’s largest nutrition school with over 60,000 students and graduates from over 120 countries. Students learn from world-class educators including Deepak Chopra, MD; Mehmet Oz, MD; and author David Wolfe; in addition to celebrity personalities such as author and activist Alicia Silverstone. IIN also boasts a star-studded list of alumni, including TV personality Daphne Oz, actress Amy Smart and Australian model Miranda Kerr. The Institute for Integrative Nutrition was founded in 1992 by Joshua Rosenthal. What started as a small classroom of passionate students in a live setting is now the world’s largest nutrition school and most well renowned Health Coach Training Program. Integrative Nutrition is the only school that educates on a national standard level established by the Health Coaching industry. 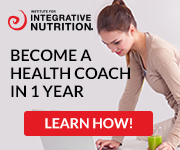 Through an innovative, one year online course built specifically for the adult learner, Integrative Nutrition’s holistic program teaches Health Coaching and business skills, personal development philosophy, and over 100 dietary theories with lectures by the world’s leading physicians, researchers, doctors, and nutrition experts. IIN is accredited! Since 2009, IIN has been licensed by the New York State Department of Education, and their continuing to gain traction and recognition by the government. Most health and nutrition schools are not accredited, but they are. Access to IIN Learning Center from your computer, smartphone, or tablet! Enjoy Career Flexibility! Build your own health coaching practice to fit your needs - part-time, full-time, in-person, online…it’s up to you. Earn a Generous Income! Many new graduates charge $100 per hour for their services. You can start seeing paying clients while you’re still in school. Find a variety of employment options! Graduates find jobs in doctor’s offices, wellness centers, and gyms as well as enhancing their existing wellness practices. The career opportunities for IIN graduates are limitless; options range from food service to writing bestselling cookbooks, from health coaching to launching all-natural beauty product lines! The sky is the limit once you get the right education. Entrepreneurs and alumni include Elizabeth Stein, Founder and CEO of Purely Elizabeth; Latham Thomas, Founder of Mama Glow; Carly de Castro of Pressed Juicery; Daniel Churchill, author and TV Host; Danielle DuBoise Co-Founder of Sakara Life; and Adina Grigore, Founder of SW Basics of Brooklyn and Sprout Skincare. What I love about this program is you can pursue a Bachelor's or Master's Degree through their Academic partnerships as well! IIN has partnerships with multiple colleges and universities to earn your degree as well as a continuing education certificate. You can learn more about their parternships here. Integrative Nutrition is more than a school; it's a movement whose program is changing the landscape of health and wellness around the world, training over 60,000 students and graduates in 124 countries. For more information, please visit http://www.integrativenutrition.com. You can also follow them on their social networks on Facebook and Twitter as well. This is a sponsored post. The company who sponsored it compensated me via a cash payment, gift, or something else of value to write it. Regardless, I only recommend products or services I use personally and believe will be good for my readers. I am disclosing this in accordance with the Federal Trade Commission’s 16 CFR, Part 255: “Guides Concerning the Use of Endorsements and Testimonials in Advertising. I definitely think that health coaching goes so far beyond just what people eat and that creating a collaborative team to help people would be awesome! same applies to any health adviser.